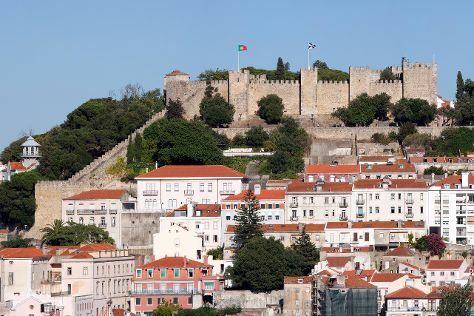 Deepen your sense of the past at sights like Castelo dos Mouros and Castelo de S. Jorge. Satisfy your inner culture vulture at Cabo da Roca and Belém Tower. Step out of Lisbon to go to Sintra and see Park and National Palace of Pena, which is approximately 44 minutes away. And it doesn't end there: admire the landmark architecture of Jeronimos Monastery, wander the streets of Rossio Square, and snap pictures at 25 de Abril Bridge. For photos, more things to do, ratings, and other tourist information, read our Lisbon trip tool . Boston, USA to Lisbon is an approximately 10-hour combination of bus and flight. You can also do a combination of train and flight. You'll lose 5 hours traveling from Boston to Lisbon due to the time zone difference. When traveling from Boston in May, plan for somewhat warmer days in Lisbon, with highs around 75°F, while nights are about the same with lows around 55°F. Wrap up your sightseeing on the 25th (Sat) early enough to travel to Porto. Step off the beaten path and head to Bom Jesus do Monte and Graham's Port Lodge. Satisfy your inner culture vulture at Centro Historico de Guimaraes and Santuario de Santa Luzia. Dedicate the 27th (Mon) to wine at some of the top wineries in the area. And it doesn't end there: steep yourself in history at Porto Cathedral (Se Catedral), get into the urban bustle at Palacio da Bolsa, take in the views from Ponte de Dom Luis I, and take in the architecture and atmosphere at Igreja da Ordem Terceira de São Francisco. For reviews, other places to visit, and tourist information, go to the Porto tour itinerary maker . Getting from Lisbon to Porto by flight takes about 2.5 hours. Other options: take a train; or drive. When traveling from Lisbon in May, plan for slightly colder days in Porto, with highs around 68°F, while nights are about the same with lows around 52°F. Finish up your sightseeing early on the 28th (Tue) so you can travel to Furnas. Explore hidden gems such as Poca Da Dona Beija and Parque Terra Nostra. Step out of the city life by going to Lagoa do Fogo and Caldeiras da Lagoa das Furnas. To see traveler tips, photos, reviews, and more tourist information, read our Furnas trip itinerary planner . Getting from Porto to Furnas by combination of flight and bus takes about 7.5 hours. Traveling from Porto to Furnas, you'll gain 1 hour due to the time zone difference. Expect somewhat warmer evenings in Furnas when traveling from Porto in May, with lows around 58°F. Wrap up your sightseeing on the 31st (Fri) early enough to travel to Sete Cidades. 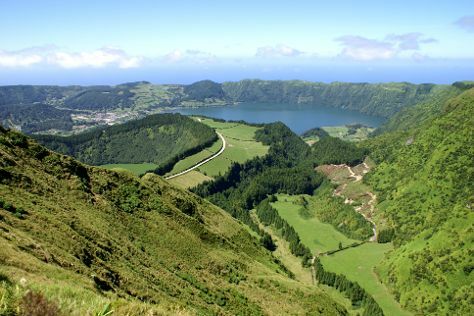 Sete Cidades is a civil parish in the center of the municipality of Ponta Delgada, that is likewise located in the center of a massive volcanic crater three miles across, also referred to as Sete Cidades. On the 1st (Sat), contemplate the waterfront views at Natural Pool, enjoy the sand and surf at Mosteiros Beach, then explore the striking landscape at Caldeira das Sete Cidades, then take your sightseeing to a higher altitude at Viewpoint of the Ridge, and finally get great views at Boca do Inferno Viewpoint. Plan my trip to Sete Cidades with suggested itineraries provided by Inspirock. Drive from Furnas to Sete Cidades in 1.5 hours. Expect a daytime high around 66°F in May, and nighttime lows around 58°F. Finish up your sightseeing early on the 1st (Sat) so you can travel back home.